When I was a kid, Sears was like this magical place at the end of the Rainbow. This was primarily due to the fact that shortly before Christmas, the special edition of the catalog would arrive and it was FILLED with toys... We would sit for hours, pouring over the toy section, with no small amount of drooling, our eyes full of toy lust. every page seemed to hold something more amazing than the last. For any younger readers out there, this was LONG before the World Wide Web, where everything you could possibly want to see was a mere click away. The Christmas Catalogs from Sears, JC Penney and Montgomery Ward (may it rest in peace) were the be-all, end-all of Toy Nirvana, the Holy Grail of playtime fantasy. If dad had to go to Sears for tires or a battery for the car (cause they did automotive work too) we would begin hopping up and down in anticipation of going there. We wanted to see all the toys in the catalog, of course, we didn't really care so much about the tires or battery. Dad would indulge us while the car was being worked on and let us scamper about this Shangri-La of toydom. There were never as many toys in the actual store as there were in the catalog, but we didn't care. It was at this time, in the 1970's, that Sears was really good at marrying with other companies to bring product lines to the public. There was the Winnie the Pooh stuff that my baby brother was smothered in. EVERYTHING was Winnie the Pooh from Sears. Curtains, bedding, pajamas, bottles, binki.... You name it, it had a yellow bear on it. Countless manufacturing companies were all licensed to produce the specific design exclusively for Sears, Roebuck and Co. There was another design... I remember the next door neighbor lady was redoing her kitchen with it just before we moved out to the farm. It was called Merry Mushroom. Dishes, Sugar Bowls, Pitchers, Canisters, Coffee Pots, Burner Covers, Towels, Place Mats, Throw Rugs, and of course... Corningware. All made to coordinate together. 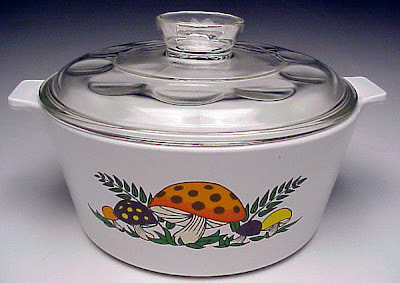 Though the "Merry Mushrooms" line was available throughout the 1970s the Corningware pieces were a later arrival and were not available for long. Merry Mushroom (1975-1977?) is surprisingly rare in it's entirety. I have seen pieces, but it's usually only the bottom half. There was something very special about Merry Mushroom. It wasn't square like all previous patterns had been. The body of the piece was based on the round Buffet Servers (which originally came in White, Avocado Green and Gold). The second thing was the lid. While the buffet servers had either Pyroceram lids or Centura lids, the Merry Mushroom had a special dimpled Pyrex lid. This is why I have never seen a piece in person in it's entirety. The lids get broken and people marry up the base with any old Pyrex lid that fits, but it really doesn't match the piece. I see it ALL the time. So watch those lids folks. If it ain't got dimples, it's goes from a Merry Mushroom to a "Married" Mushroom. Oh how I remember my sisters and I oohin and aahhing over the toy catalog. One of the simple pleasures lost. Do you know why some of the Merry Mushroom pieces were not stamped Sears Roebuck and Co mor dated? I just bought the soup tureen and it only has a made in Japan sticker. Thank you! I can really only speak in regards to Corning Ware, because that is what I collect, not Merry Mushroom in general.. However, there are several copy pieces that were not part of the Sears pattern campaign... But also, the manufacturers all had different ways of marking their pieces, which was not necessarily dictated by the Sears & Roebuck company. So the tureen you have may be.marled exactly the same as any other pattern they may have produced, simply because that is just how that particular company marked their pieces.